At Harper, the quality of the images you reproduce is the number one priority. Harper Corporation is the undisputed innovator in anilox roll production and restoration for the corrugated, wide web, narrow web and newspaper flexographic printing markets worldwide. Throughout its 45 year history, Harper Corporation has introduced a line of products and technologies that set standards for the industry. Echocel™ laser-engraved, ceramic anilox rolls paved the way for – up to 1200 cells per inch. This roll provided the industry with the first 60° hexagonal cell configuration, which today is the standard pattern for high quality flexo printing throughout the world. The consistent, repeatable cell structure of these rolls assisted printers in achieving printing clarity never before possible. It is no wonder that Harper manufactures and restores more anilox rolls than any other manufacturer in the world, in facilities that are certified ISO 9001:2000. Today, the advanced technologies facilities operate more laser systems than any other anilox roll manufacturer in the world. With a mission that is unwavering, Harper continues to advance the printing capabilities of their customers and pioneer new technology that will open new markets. As quickly as technology advances, The Harper Group of Flexo Companies will be there to pioneer yet another new development for the industry. 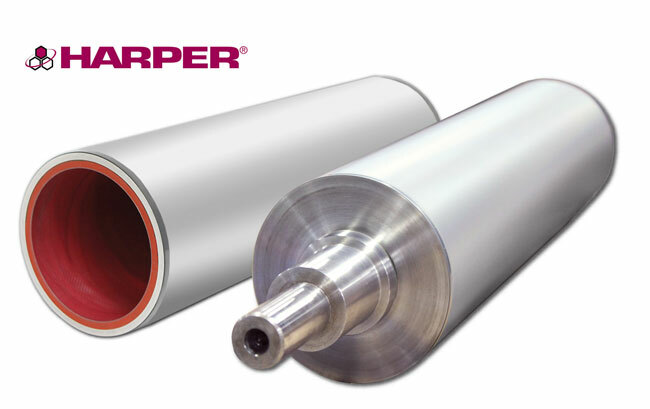 From the Anilox Roll Division, Harper manufactures and restores rolls designed for better surface transfer, greater volume transfer, higher line screen precision, more consistency and faster speeds. No one in the world has manufactured ceramic anilox rolls longer than Harper Corporation. From the advent of flexographic printing and Anilox Roll manufacturing, Harper Corporation of America has earned the distinction of being the first, the best, and the global leader in new anilox roll products and technologies. Every claim Harper makes about its products, services and support is backed by the best warranty in the industry. The XLT™ digital technology was developed for precisely transferring thin ink films with micron accuracy. We recommend and guarantee that when you work with the strongest, thinnest film of ink, you will get the best ink mileage, best print quality, easiest impression set-up, and you’ll get it at the most consistent levels possible. The XDI™ offers gravure printers the performance, savings and longevity of a ceramic anilox roll. With our proprietary processes, we can burn digital data, patterns, line/shape patterns, logos, graphics and tonal dots of almost any conceivable shape. These patterns and images of high accuracy and predictability can be measured in microns. Our ceramic surface allows for forward or reverse metering and up to 10 times the life over chrome. HarperScientific™ is the Printing and Coatings Supplies Division of Harper Corporation of America, and provides products and services to flexographic printers all over the world. As a leader in the precision proofing market, HarperScientific supplies precision proofers, safe and user-friendly ink cleaners and measurement equipment. And to protect your investment—sleeves and storage systems.